Every company who has signed a construction contract should know what a submittal is: physical document samples delivered to architects, engineers, or consultants before the work is done so that they can review the details and verify that the work being done meets specifications. These documents include shop drawings, material samples, product information, test data, and more. What most companies don’t know unless they’ve learned the hard way, is why submittals are so important. UDA Technologies is one of the fastest growing providers of construction productivity software in the United States, Canada, Australia, and 75 countries worldwide with double digit, industry leading revenue growth. Designed for growing businesses, UDA construction software manages over 65 billion dollars of construction annually. Used by over 500,000 construction professionals worldwide, ConstructionOnline™ is the leading online construction management program. As the industry evolves, ConstructionOnline is growing with it. With the addition of ConstructionOnline Pro Features, there has never been an easier or more versatile way to begin managing your business straight from the job site. 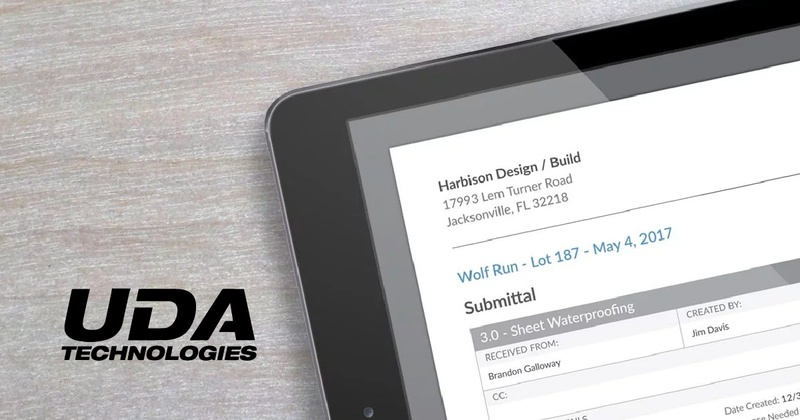 UDA Technologies is one of the fastest growing providers of construction productivity software in the United States, Canada, Australia, and 75 countries worldwide with double digit, industry leading revenue growth. Designed for growing businesses, UDA construction software manages over 65 billion dollars of construction annually. Identified as a key partner in construction software technology, UDA Technologies is a Microsoft Partner and a Premier Intuit QuickBooks developer. UDA Technologies, a recognized innovator in the construction technology industry, was founded on a desire to revolutionize the construction world by bringing millions of users together with a single purpose: to create a platform that empowers construction professionals to build a better world by harnessing technology to lower the cost of construction. In order to achieve this purpose, we operate on a handful of core beliefs. We believe in an open network which opens channels of communication and removes barriers. We believe that software is empowering. We believe in leveling the playing field. We believe in dreaming big. Our goal is your success and we believe our products should help grow the most successful and renowned companies in the world. UDA ConstructionOnline is the world's fastest-growing platform for construction professionals. Used by over 550,000 construction professionals in 75 countries worldwide, UDA software manages over $65 billion in projects every day.